Glutamate [NMDA] receptor subunit epsilon-1 is a protein that in humans is encoded by the GRIN2A gene. N-methyl-D-aspartate (NMDA) receptors are a class of ionotropic glutamate receptors. NMDA channel has been shown to be involved in long-term potentiation, an activity-dependent increase in the efficiency of synaptic transmission thought to underlie certain kinds of memory and learning. 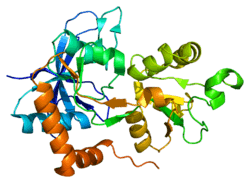 NMDA receptor channels are heteromers composed of the key receptor subunit NMDAR1 (GRIN1) and 1 or more of the 4 NMDAR2 subunits: NMDAR2A (GRIN2A), NMDAR2B (GRIN2B), NMDAR2C (GRIN2C), and NMDAR2D (GRIN2D). Variants of the gene are associated with the protective effect of coffee on Parkinson's disease. Mutations in GRIN2A are associated to refractory epilepsy . ↑ "Diseases that are genetically associated with GRIN2A view/edit references on wikidata". ↑ "Drugs that physically interact with Glutamate receptor ionotropic, NMDA 2A view/edit references on wikidata". ↑ Kalsi G, Whiting P, Bourdelles BL, Callen D, Barnard EA, Gurling H (April 1998). "Localization of the human NMDAR2D receptor subunit gene (GRIN2D) to 19q13.1-qter, the NMDAR2A subunit gene to 16p13.2 (GRIN2A), and the NMDAR2C subunit gene (GRIN2C) to 17q24-q25 using somatic cell hybrid and radiation hybrid mapping panels". Genomics. 47 (3): 423–5. doi:10.1006/geno.1997.5132. PMID 9480759. ↑ "Entrez Gene: GRIN2A glutamate receptor, ionotropic, N-methyl D-aspartate 2A". ↑ Hamza TH, Chen H, Hill-Burns EM, Rhodes SL, Montimurro J, Kay DM, Tenesa A, Kusel VI, Sheehan P, Eaaswarkhanth M, Yearout D, Samii A, Roberts JW, Agarwal P, Bordelon Y, Park Y, Wang L, Gao J, Vance JM, Kendler KS, Bacanu SA, Scott WK, Ritz B, Nutt J, Factor SA, Zabetian CP, Payami H (August 2011). "Genome-wide gene-environment study identifies glutamate receptor gene GRIN2A as a Parkinson's disease modifier gene via interaction with coffee". PLoS Genet. 7 (8): e1002237. doi:10.1371/journal.pgen.1002237. PMC 3158052 . PMID 21876681. ↑ Yamada-Fowler N, Fredrikson M, Söderkvist P (June 2014). "Caffeine interaction with glutamate receptor gene GRIN2A: Parkinson's disease in Swedish population". PLoS ONE. 9 (6): e99294. doi:10.1371/journal.pone.0099294. PMC 4051678 . PMID 24915238. ↑ Venkateswaran S, Myers KA, Smith AC, Beaulieu CL, Schwartzentruber JA, Majewski J, Bulman D, Boycott KM, Dyment DA (2014). "Whole-exome sequencing in an individual with severe global developmental delay and intractable epilepsy identifies a novel, de novo GRIN2A mutation". Epilepsia. 55 (7): e75–9. doi:10.1111/epi.12663. PMID 24903190. ↑ Gardoni F, Mauceri D, Fiorentini C, Bellone C, Missale C, Cattabeni F, Di Luca M (November 2003). "CaMKII-dependent phosphorylation regulates SAP97/NR2A interaction". J. Biol. Chem. 278 (45): 44745–52. doi:10.1074/jbc.M303576200. PMID 12933808. 1 2 Irie M, Hata Y, Takeuchi M, Ichtchenko K, Toyoda A, Hirao K, Takai Y, Rosahl TW, Südhof TC (September 1997). "Binding of neuroligins to PSD-95". Science. 277 (5331): 1511–5. doi:10.1126/science.277.5331.1511. PMID 9278515. 1 2 Lim IA, Hall DD, Hell JW (June 2002). "Selectivity and promiscuity of the first and second PDZ domains of PSD-95 and synapse-associated protein 102". J. Biol. Chem. 277 (24): 21697–711. doi:10.1074/jbc.M112339200. PMID 11937501. 1 2 Hou XY, Zhang GY, Yan JZ, Chen M, Liu Y (November 2002). "Activation of NMDA receptors and L-type voltage-gated calcium channels mediates enhanced formation of Fyn-PSD95-NR2A complex after transient brain ischemia". Brain Res. 955 (1-2): 123–32. doi:10.1016/s0006-8993(02)03376-0. PMID 12419528. ↑ Satoh K, Yanai H, Senda T, Kohu K, Nakamura T, Okumura N, Matsumine A, Kobayashi S, Toyoshima K, Akiyama T (June 1997). "DAP-1, a novel protein that interacts with the guanylate kinase-like domains of hDLG and PSD-95". Genes Cells. 2 (6): 415–24. doi:10.1046/j.1365-2443.1997.1310329.x. PMID 9286858. ↑ Sans N, Petralia RS, Wang YX, Blahos J, Hell JW, Wenthold RJ (February 2000). "A developmental change in NMDA receptor-associated proteins at hippocampal synapses". J. Neurosci. 20 (3): 1260–71. PMID 10648730. 1 2 Ma J, Zhang GY (September 2003). "Lithium reduced N-methyl-D-aspartate receptor subunit 2A tyrosine phosphorylation and its interactions with Src and Fyn mediated by PSD-95 in rat hippocampus following cerebral ischemia". Neurosci. Lett. 348 (3): 185–9. doi:10.1016/s0304-3940(03)00784-5. PMID 12932824. ↑ Tezuka T, Umemori H, Akiyama T, Nakanishi S, Yamamoto T (January 1999). "PSD-95 promotes Fyn-mediated tyrosine phosphorylation of the N-methyl-D-aspartate receptor subunit NR2A". Proc. Natl. Acad. Sci. U.S.A. 96 (2): 435–40. doi:10.1073/pnas.96.2.435. PMC 15154 . PMID 9892651. 1 2 Takagi N, Cheung HH, Bissoon N, Teves L, Wallace MC, Gurd JW (August 1999). "The effect of transient global ischemia on the interaction of Src and Fyn with the N-methyl-D-aspartate receptor and postsynaptic densities: possible involvement of Src homology 2 domains". J. Cereb. Blood Flow Metab. 19 (8): 880–8. doi:10.1097/00004647-199908000-00007. PMID 10458595. ↑ Kurschner C, Yuzaki M (September 1999). "Neuronal interleukin-16 (NIL-16): a dual function PDZ domain protein". J. Neurosci. 19 (18): 7770–80. PMID 10479680. ↑ Seabold GK, Burette A, Lim IA, Weinberg RJ, Hell JW (April 2003). "Interaction of the tyrosine kinase Pyk2 with the N-methyl-D-aspartate receptor complex via the Src homology 3 domains of PSD-95 and SAP102". J. Biol. Chem. 278 (17): 15040–8. doi:10.1074/jbc.M212825200. PMID 12576483. ↑ Liu Y, Zhang G, Gao C, Hou X (August 2001). "NMDA receptor activation results in tyrosine phosphorylation of NMDA receptor subunit 2A(NR2A) and interaction of Pyk2 and Src with NR2A after transient cerebral ischemia and reperfusion". Brain Res. 909 (1-2): 51–8. doi:10.1016/s0006-8993(01)02619-1. PMID 11478920. Schröder HC, Perovic S, Kavsan V, Ushijima H, Müller WE (1998). "Mechanisms of prionSc- and HIV-1 gp120 induced neuronal cell death". Neurotoxicology. 19 (4-5): 683–8. PMID 9745929. King JE, Eugenin EA, Buckner CM, Berman JW (2006). "HIV tat and neurotoxicity". Microbes Infect. 8 (5): 1347–57. doi:10.1016/j.micinf.2005.11.014. PMID 16697675. Monyer H, Sprengel R, Schoepfer R, Herb A, Higuchi M, Lomeli H, Burnashev N, Sakmann B, Seeburg PH (1992). "Heteromeric NMDA receptors: molecular and functional distinction of subtypes". Science. 256 (5060): 1217–21. doi:10.1126/science.256.5060.1217. PMID 1350383. Kornau HC, Schenker LT, Kennedy MB, Seeburg PH (1995). "Domain interaction between NMDA receptor subunits and the postsynaptic density protein PSD-95". Science. 269 (5231): 1737–40. doi:10.1126/science.7569905. PMID 7569905. Magnuson DS, Knudsen BE, Geiger JD, Brownstone RM, Nath A (1995). "Human immunodeficiency virus type 1 tat activates non-N-methyl-D-aspartate excitatory amino acid receptors and causes neurotoxicity". Ann. Neurol. 37 (3): 373–80. doi:10.1002/ana.410370314. PMID 7695237. Sakimura K, Kutsuwada T, Ito I, Manabe T, Takayama C, Kushiya E, Yagi T, Aizawa S, Inoue Y, Sugiyama H (1995). "Reduced hippocampal LTP and spatial learning in mice lacking NMDA receptor epsilon 1 subunit". Nature. 373 (6510): 151–5. doi:10.1038/373151a0. PMID 7816096. Foldes RL, Adams SL, Fantaske RP, Kamboj RK (1994). "Human N-methyl-D-aspartate receptor modulatory subunit hNR2A: cloning and sequencing of the cDNA and primary structure of the protein". Biochim. Biophys. Acta. 1223 (1): 155–9. doi:10.1016/0167-4889(94)90086-8. PMID 8061049. Sheng M, Cummings J, Roldan LA, Jan YN, Jan LY (1994). "Changing subunit composition of heteromeric NMDA receptors during development of rat cortex". Nature. 368 (6467): 144–7. doi:10.1038/368144a0. PMID 8139656. Roche KW, Raymond LA, Blackstone C, Huganir RL (1994). "Transmembrane topology of the glutamate receptor subunit GluR6". J. Biol. Chem. 269 (16): 11679–82. PMID 8163463. Takano H, Onodera O, Tanaka H, Mori H, Sakimura K, Hori T, Kobayashi H, Mishina M, Tsuji S (1993). "Chromosomal localization of the epsilon 1, epsilon 3 and zeta 1 subunit genes of the human NMDA receptor channel". Biochem. Biophys. Res. Commun. 197 (2): 922–6. doi:10.1006/bbrc.1993.2567. PMID 8267632. Lannuzel A, Lledo PM, Lamghitnia HO, Vincent JD, Tardieu M (1995). "HIV-1 envelope proteins gp120 and gp160 potentiate NMDA-induced [Ca2+]i increase, alter [Ca2+]i homeostasis and induce neurotoxicity in human embryonic neurons". Eur. J. Neurosci. 7 (11): 2285–93. doi:10.1111/j.1460-9568.1995.tb00649.x. PMID 8563977. Corasaniti MT, Melino G, Navarra M, Garaci E, Finazzi-Agrò A, Nisticò G (1995). "Death of cultured human neuroblastoma cells induced by HIV-1 gp120 is prevented by NMDA receptor antagonists and inhibitors of nitric oxide and cyclooxygenase". Neurodegeneration. 4 (3): 315–21. doi:10.1016/1055-8330(95)90021-7. PMID 8581564. Niethammer M, Kim E, Sheng M (1996). "Interaction between the C terminus of NMDA receptor subunits and multiple members of the PSD-95 family of membrane-associated guanylate kinases". J. Neurosci. 16 (7): 2157–63. PMID 8601796. Pittaluga A, Pattarini R, Severi P, Raiteri M (1996). "Human brain N-methyl-D-aspartate receptors regulating noradrenaline release are positively modulated by HIV-1 coat protein gp120". AIDS. 10 (5): 463–8. doi:10.1097/00002030-199605000-00003. PMID 8724036. Hess SD, Daggett LP, Crona J, Deal C, Lu CC, Urrutia A, Chavez-Noriega L, Ellis SB, Johnson EC, Veliçelebi G (1996). "Cloning and functional characterization of human heteromeric N-methyl-D-aspartate receptors". J. Pharmacol. Exp. Ther. 278 (2): 808–16. PMID 8768735. Wu P, Price P, Du B, Hatch WC, Terwilliger EF (1996). "Direct cytotoxicity of HIV-1 envelope protein gp120 on human NT neurons". NeuroReport. 7 (5): 1045–9. doi:10.1097/00001756-199604100-00018. PMID 8804048. Bennett BA, Rusyniak DE, Hollingsworth CK (1995). "HIV-1 gp120-induced neurotoxicity to midbrain dopamine cultures". Brain Res. 705 (1-2): 168–76. doi:10.1016/0006-8993(95)01166-8. PMID 8821747. Toggas SM, Masliah E, Mucke L (1996). "Prevention of HIV-1 gp120-induced neuronal damage in the central nervous system of transgenic mice by the NMDA receptor antagonist memantine". Brain Res. 706 (2): 303–7. doi:10.1016/0006-8993(95)01197-8. PMID 8822372. Dreyer EB, Lipton SA (1995). "The coat protein gp120 of HIV-1 inhibits astrocyte uptake of excitatory amino acids via macrophage arachidonic acid". Eur. J. Neurosci. 7 (12): 2502–7. doi:10.1111/j.1460-9568.1995.tb01048.x. PMID 8845955. Raber J, Toggas SM, Lee S, Bloom FE, Epstein CJ, Mucke L (1996). "Central nervous system expression of HIV-1 Gp120 activates the hypothalamic-pituitary-adrenal axis: evidence for involvement of NMDA receptors and nitric oxide synthase". Virology. 226 (2): 362–73. doi:10.1006/viro.1996.0664. PMID 8955056.